The Affordable Care Act, passed in 2010 and initially referred to as "Obamacare" by opponents, sought to expand healthcare access by regulating the healthcare insurance industry and lowering costs of healthcare and heath insurance premiums for consumers. With the overlapping goals of covering more people and lowering the cost of healthcare, the ACA required states to expand Medicaid eligibility requirements to allow for more individuals to qualify for Medicaid. Medicaid provides health insurance coverage at no cost for low income families with children. Medicaid is funded by general tax revenues that are given to the states who administer the Medicaid program. The ACA required states to expand coverage of Medicaid or else face loss of Medicaid funds altogether. 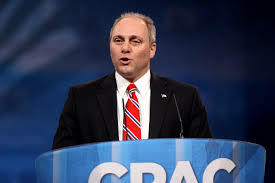 The U.S. Supreme Court ruled in 2012 that the provision in the ACA requiring states to expand their Medicaid coverage or else lose Medicaid funds was too "coercive". Despite the promise of the federal government to cover 93-100% of the cost of covering additional people, many conservative states, in ideological and partisan opposition to the law and President Obama, declined the expansion. This is how we get to the current patchwork of expanded Medicaid coverage across the country today. These states argue that the state cannot afford the expansion and does not support the greater role of the federal government in healthcare. 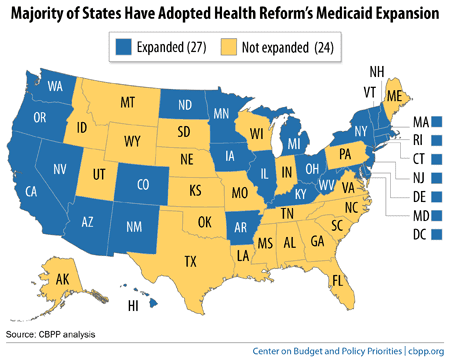 The map above shows which states have accepted the federal funding to expand Medicaid eligibility and which states have rejected the funds and expansion. The link below from Kaiser provides a more detailed description state by state. Without the expansion limited groups qualify for Medicaid. Of course, there is an income limit, but what most may not know is that, under the past Medicaid eligibility rules and the current rules of states that declined the expansion, only very low income individuals that have children, individuals that qualify for disability under extreme financial hardship, and low income pregnant women may qualify for Medicaid. The Medicaid expansion opens up eligibility to more by allowing for low-income adults (with or without children) to qualify for the coverage. Because the Supreme Court ruled that it must be state choice to expand Medicaid individuals of similar economic circumstances in two different states are under different eligibility guidelines. For example, "Tom" in New Mexico can qualify for Medicaid and have access to doctors and hospitals despite his low income, while "Sam" in Georgia does not have that same access, although both do not have children and unable to afford healthcare without financial assistance. While some conservative/Republican dominated states in terms of party loyalty or leadership have changed their minds and accepted the expansion, most have not. As can be seen in the interactive maps provided by The New York Times at "We Mapped the Uninsured", the states that have declined the expansion are typically conservative in their politics, with Republicans usually dominating voting for key political offices, such as Governor or the state legislature. There is another dynamic to the Medicaid expansion issue that is of interest. This is the phenomenon studied in Political Science known as the "reverse income effect". Notice that the dichotomous display of color in the expanded/not expanded Medicaid map above is very similar to the pattern in the Presidential election results maps for 2008 and 2012. In most cases the states on the Medicaid map that did NOT expand Medicaid, are the "red" states on the presidential election maps that depict which candidate, Republican or Democrat, that the state's electoral votes were awarded to. This, of course, is typically determined by the winning candidate of the popular vote count in that state. The New York Times maps show that the states with the highest number of uninsured are these very red states. Also important, is that these states had the highest number of uninsured to begin with, and still do since the states have chosen not to expand Medicaid under the ACA. 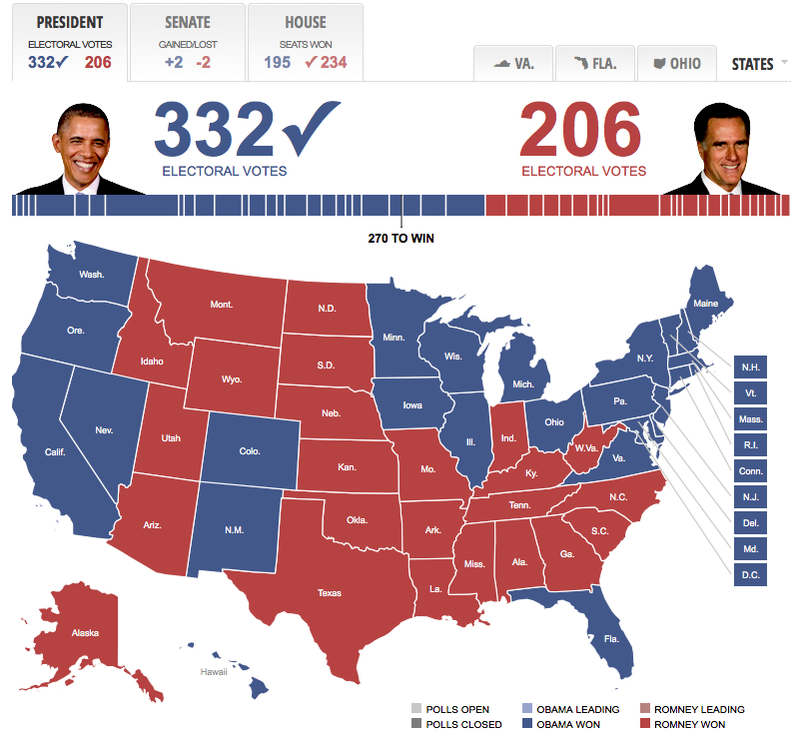 Perhaps more red states in the near future will opt in to the expansion under the increasing pressure of the uninsured. This similarity brings up the political science phenomenon of the "reverse income effect". If we look at data depicting voting patterns among low income and then among high income individuals we see that high income individuals are more likely to vote Republican, while low-income individuals are more likely to vote Democrat. This is usually explained by the fact that Republicans are conservative in ideology, preferring lower taxes on businesses and individuals, even on high income earners, as well as less regulation on businesses. Higher income make up a higher percentage of business owners. Democrats tend to be more supportive of programs and regulations designed to benefit or protect consumers and low-income individuals. This, perhaps explains the increase in support for Democrats as income decreases. In the 2012 Presidential Election, roughly 60% of voters earning less than $50,000 annually voted for President Obama, the Democratic candidate. This is true for previous and recent presidential elections. The percentage may have been higher had more low-income individuals voted in the election. Voter turnout rates tend to be lower among lower income level groups. The "reverse income effect" notes that while lower income individuals tend to vote Democratic, and higher income individuals Republican, the same is not true if we look at statewide data against electoral vote outcomes. As the map to the left suggests when analyzed next to Presidential election outcome maps, the states with the lowest median income levels, the poorer states, tend to award Republican candidates more votes than Democrats for the Presidency and various state-wide offices; while the states with median income levels in the higher ranges tend to award Democrats their electoral votes and votes for various state offices. In the map above, the darker the blue shading, the higher the median income level of the state. The light blue states have the lowest median income levels. 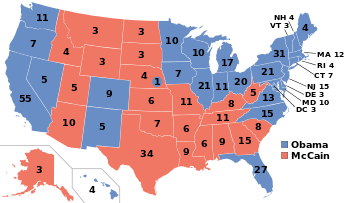 Notice that most, if not all, of the states depicting the two shades of light blue are the states that are considered to be conservative in ideological leaning and Republican party dominated. Therefore the lower the income level of the individual, the higher the probability of voting Democrat; but the lower the median income of the state, the higher the probability of the state giving electoral votes to the Republican. This paradox is interesting but may be explained by the presence of other variables that influence voting. For example, Republican dominated states are usually more socially and culturally conservative in terms of voter makeup, which may explain why these states, despite having lower incomes on average, tend to allow for Republican victories. Additionally, minorities (especially blacks and Latinos) tend to vote Democratic for economic and political reasons, such as support for civil rights protections. Blacks and Latinos make us a disproportionately large share of low-income earners and those living below the poverty level, which is one explanation for why votes among low-income earners tend to go to Democrats, but why statewide data suggests the opposite, higher probability of voting Republican. Now looking at the Median income level map in comparison to the "Expand/Don't Expand Medicaid" map, it is apparent that the states that may be most in need of expanding Medicaid coverage in terms of median income levels and inability to afford healthcare without assistance, are the very states that rejected the federally funded expansion of Medicaid under the Affordable Care Act. Therefore, the states that will not expand Medicaid have a disproportionately higher share of individuals who will not qualify for Medicaid under the current requirements but cannot afford health insurance, or even health care for that matter without assistance, assistance which their state has rejected.